This, of course, means I’m going for a huge gamble. When I use Kryptonite, I get to choose the order in which the BACs trigger, and so I can trigger Team Up, make all of my characters insanely huge, and then use Orbital Strike to reroll my board and hope, HOPE, that I just obliterate the opposition. 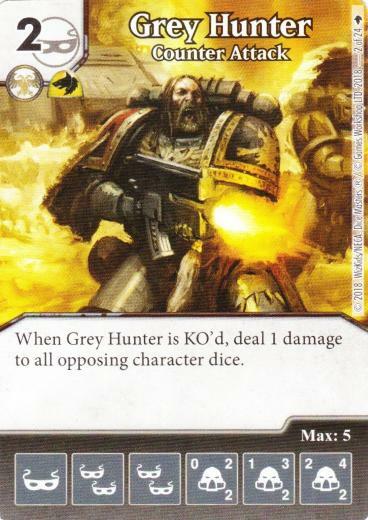 This brings me to Grey Hunter and Poxwalker. Both are there because they’re cheap, two-affiliation characters. Warhammer’s definitely great at giving us those. 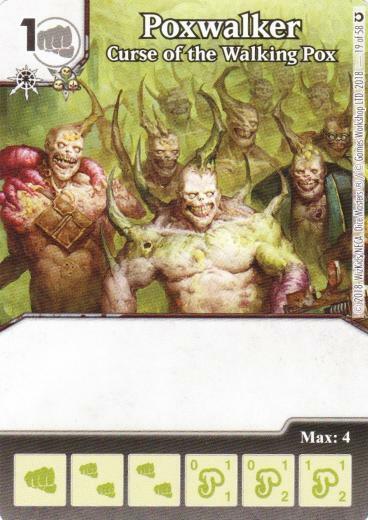 Poxwalker has the added advantage that if I see Resurrection on the other side and I prepare to use Kryptonite, I can buy Poxwalker for 1 energy to have a die to roll when using their Resurrection. Ant-man is also there for the affiliations, and Blob’s there for control. Boom Boom is there to soften up the opponent and act as Shriek bait. Now, count the amount of affiliations on these teams and I have…10. Yep, a potential +9 buff from Team Up, guaranteeing that each character I would roll on a character face would take off half or more of my opponent’s health. Insane. All of this insanity, and I still need a ramp engine. Luckily, old-school PXG is still around, so I went for this old standby. Before I describe the games, I should emphasize: if I do this combo, and I miss my roll when I use Orbital Strike, it will cost me the game almost every time. This team definitely does cater more to the gamblers. Not what I typically go for, but for once, let’s go for it. The first game of the evening was against a Collector + Nobby team. Thankfully, his damage takes a bit of time to set up; he needed to get some villains before he could use the Collector tricks, and that gave me the time to do my big setup. 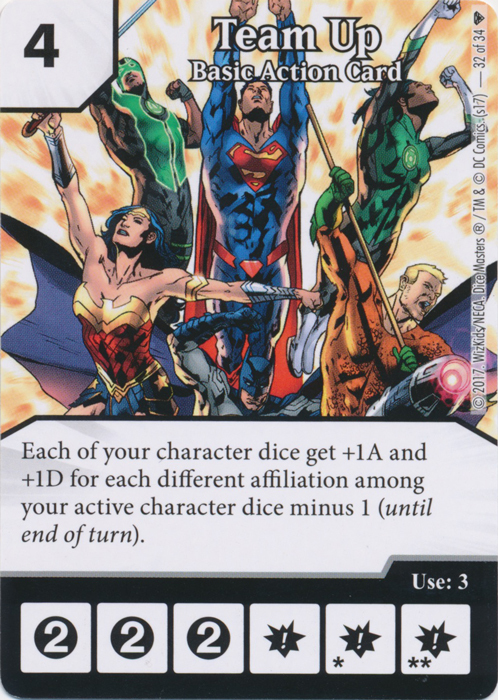 Got 5 characters, 9 affiliations, used Kryptonite, aaaand…everyone rolled energy. Everyone. So my whole board was KO’d. Well, I did say this was a gambler’s team. Thankfully, though, my opponent didn’t have enough offensive power to take advantage on the following turn. This gave me the time to re-field my guys and try again shortly after. With 8 characters (5 non-sidekicks + 3 sidekicks) and 9 affiliations, I used Kryptonite, and…four characters landed on character faces with Orbital Strike for 38 (!) damage. I won. My opponent for this game had his Thunderbolts team, and saw what happened the previous game. He was trying to curse my dice the whole game (didn’t work). His team had the firepower to really make me pay if I missed. Thankfully, I didn’t. I set up with a slightly smaller board (“just” 7 affiliations this time), including Boom Boom, used Kryptonite, rolled 3 characters for lethal damage before even counting Boom Boom’s damage, and I just blew through his team. I won and was starting to feel like I was playing a bit dirty by that point. I finished the evening against a surprisingly potent Ultramarines team. It was primarily just built as an aggro team, and with Range there to snipe blockers off, he could manage to sneak a lot of damage in pretty quick. Problem is, my team was faster. Despite a horrendous first turn (sidekick, sidekick, bolt after reroll), I managed to recover and set up a big board presence quickly. 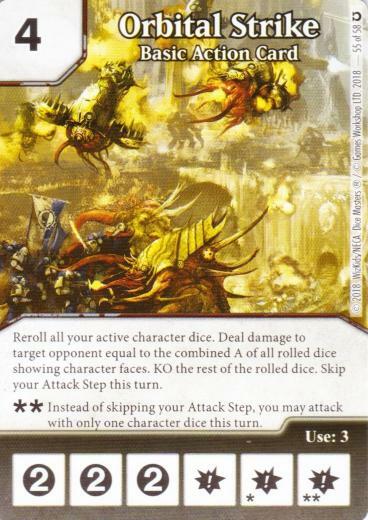 With 8 affiliations, I got the combo off, rolled 3 characters with Orbital Strike, and…yeah, game over. As with my previous opponent, he could’ve obliterated me if I missed, but I didn’t. -I thought this team was a big gamble, but it turns out that the odds are surprisingly good. Say I have 5 dice, with each having a 50% chance to roll character, my odds of getting 2 to roll a character face (which is all I’d need for lethal pretty much every time if Boom Boom’s active) are overwhelmingly likely (just over 90%, from my calculations). -You could do a similar strategy in Modern if you want. Use U Morph (copying Orbital Strike) and buy Team Up (preferably with a discount, e.g. Thor from AI), while fielding tons of cheap multi-affiliation characters. Of course, there’s more ways to counter this strategy normally (Green Devil Mask had been banned in a previous week, for example), but I could see someone making this work semi-competitively in Modern. Overall, I love playing with Orbital Strike. It’s silly, fun, and a great way to get around games walling up, either by giving you the win…or giving it to the opponent. Definitely want to revisit it later. Ultramarines were too slow here, but that’s because I was running an SR Ultraman team with PXG relying on tons of low-cost characters (he also ran Big Entrance, which I found quite useful). So against broken Golden Age/Global Escalation stuff, it can be a bit slow. But keep in mind: it was undefeated until I beat it. It’s still pretty potent. I could see them pretty good in semi-competitive Modern tournaments (e.g. where people have a gentlemen’s agreement not to run SRYT).